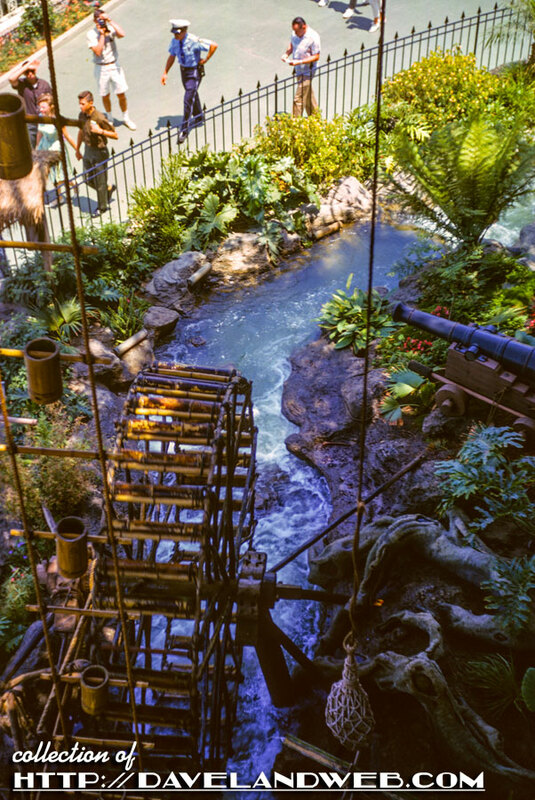 Ron Scheider helped identify this interior slide from the Davy Crockett Arcade in Frontierland. Read his comment on this blog for more cool info. Here’s an early view of Monstro. This posting was triggered by a similar one that Matterhorn posted last week. The best part of this shot is seeing the water spraying out of the top of his head! 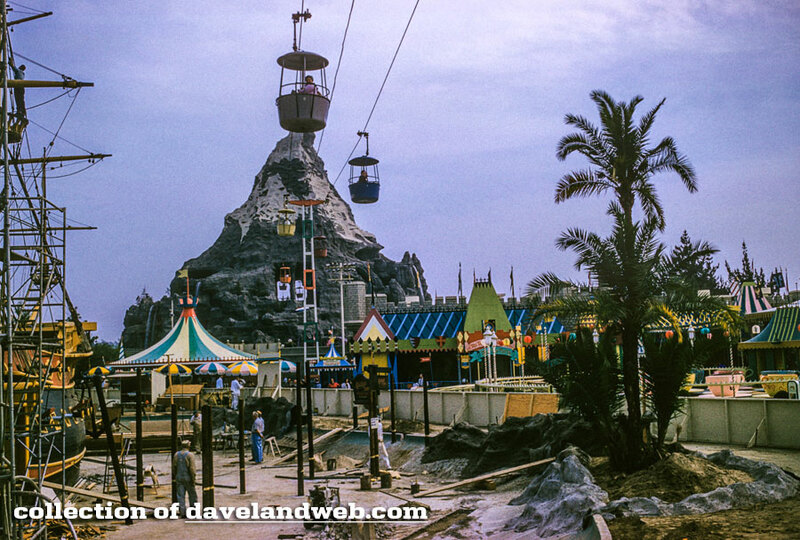 This shot from August, 1960 gives an interesting view of Fantasyland, The Matterhorn, and the Skyway. To the left is the Chicken of the Sea ship, which is in the process of adding the Skull Rock lagoon area around the ship. Once again, Matterhorn pulls through with an identification for me. This building is located near the bazaar in Adventureland...and again, looks like another security guard on the far left, or someone from the military. Here’s another one from August 1956. Fort Wilderness has been closed up for awhile now, and is used as a staging ground for the show “Fantasmic!”, located on the Rivers of America. Here’s to hoping that they eventually open it back up again. 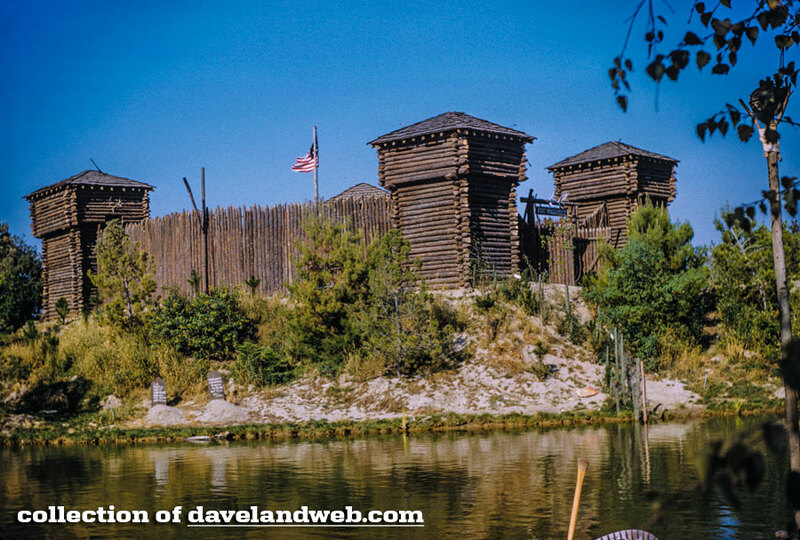 See more Fort Wilderness photos at my main website. 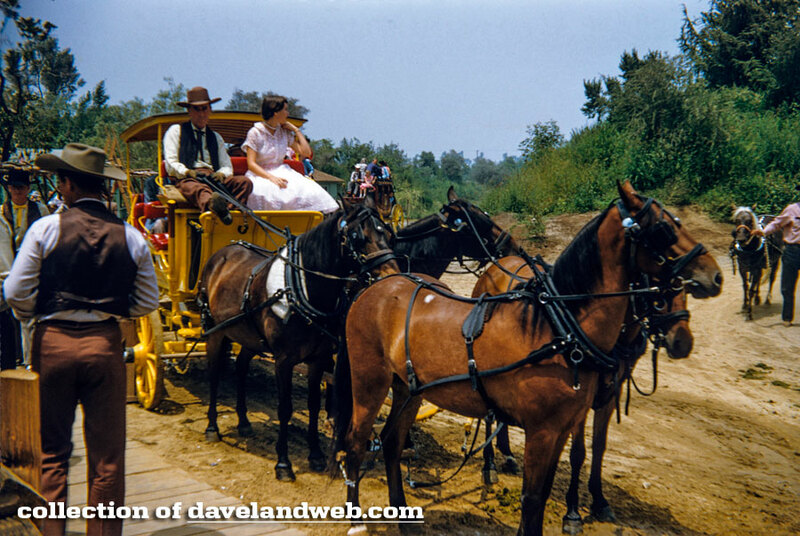 Until 1960, it was possible to ride a Stagecoach like this and tour the sights of Frontierland. From December, 1955 comes this shot of the Red Wagon Inn on Main Street. 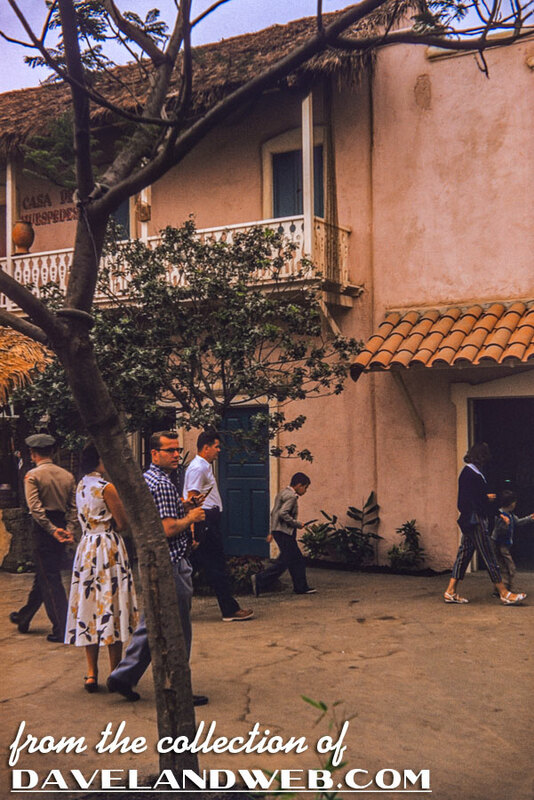 In 1965, it was changed to the Plaza Inn. The 1890’s decor is authentic, including the stained glass ceiling, entrance hall and foyer taken from the old St. James mansion in Los Angeles. I love this shot of the waiters holding the doors open, waiting for what would appear to be their first customer of the day. 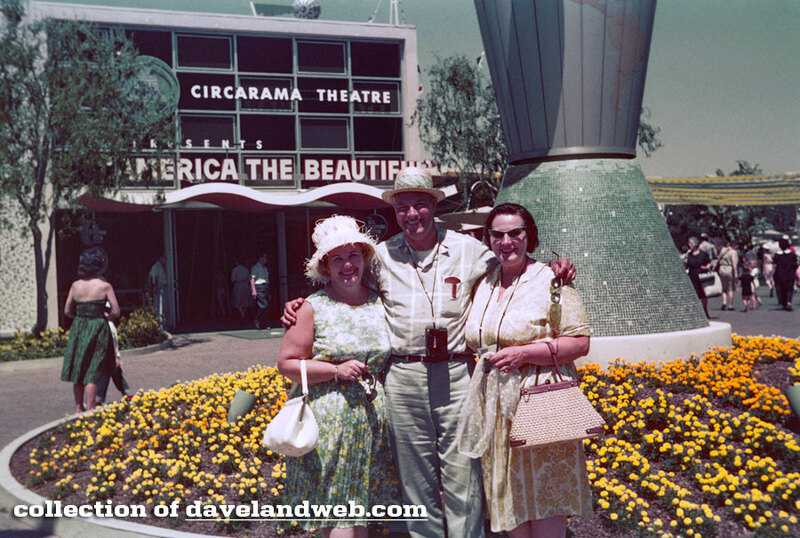 See more vintage & current Disneyland photos at my website. 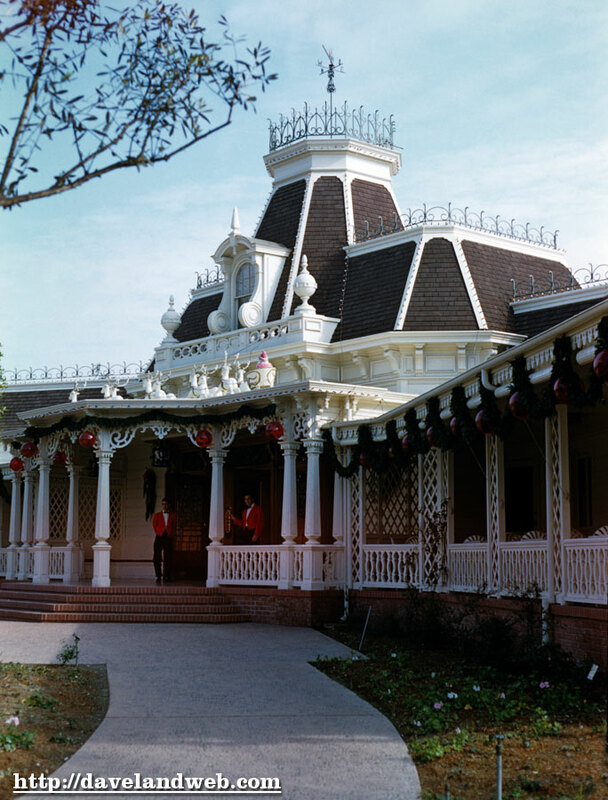 Before there was a New Orleans Square, the train station in that area hailed from Frontierland. This shot is from August, 1958. It doesn’t look all that different today, and next to Main Street, it’s still one of my favorite stations in the park. 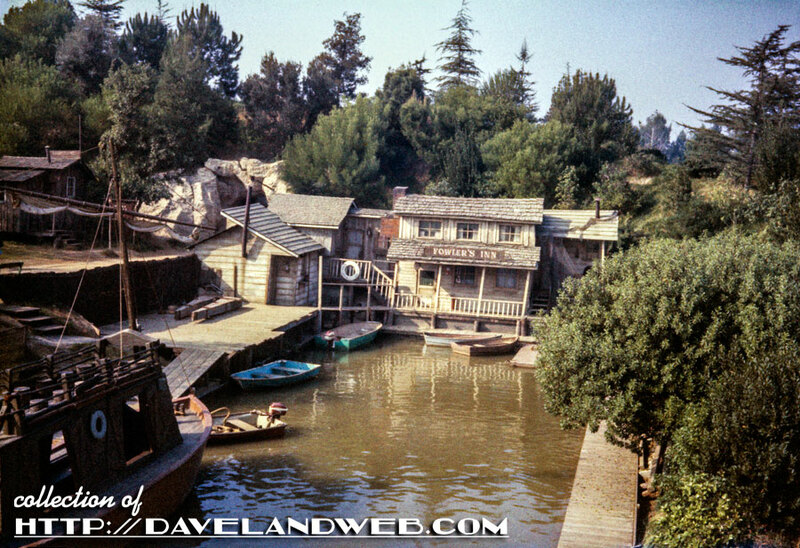 A little while ago in the Disneyland Blog Circle there was a rash of postings on Fowler’s Harbor. 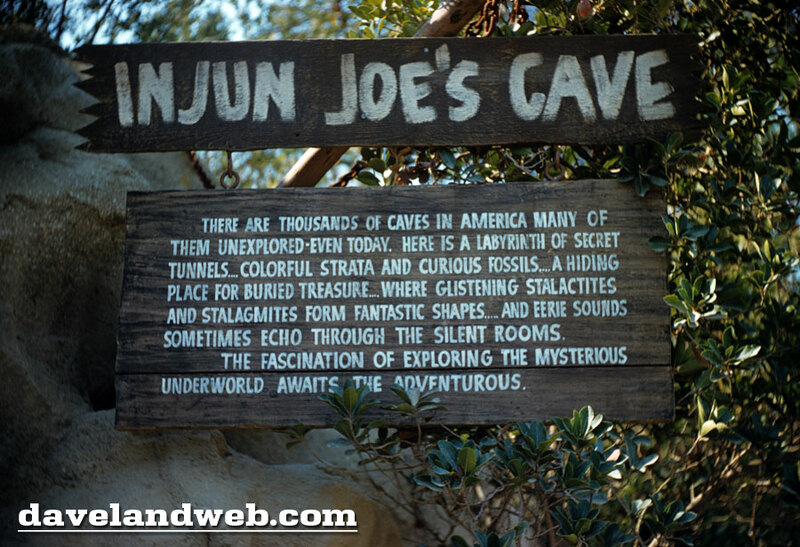 I’d never heard of it, so of course, it was great to learn something else new about the park. Here’s my contribution, with just the slightest peek on the left of a Keelboat. Another park favorite for me as a kid was this way-cool gadget-filled tree house. Exploring up and down and all around, it was a total fantasy home for any child. I also loved the fact that nobody was “living” in this tree house, so it was easy to imagine it as my own. Now that it has been changed to Tarzan’s abode, complete with cartoony figures, the charm of the tree house has diminished somewhat. Note Mr. Security Guard, appearing to be getting ready to pull something out of his holster (and at the same time, about to ruin somebody’s photo). 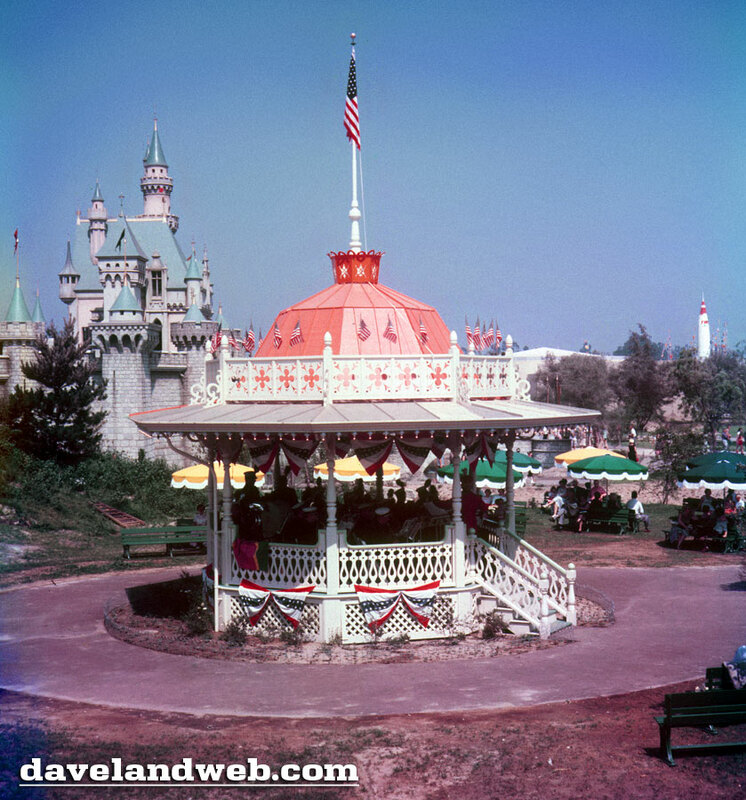 See more vintage & current Disneyland Treehouse photos at my Treehouse web page. NPC stands for Non-Politically-Correct, which is what this scene used to be considered. There was a big brouha after the 1995 remodel, when the public labeled the changes as PC. 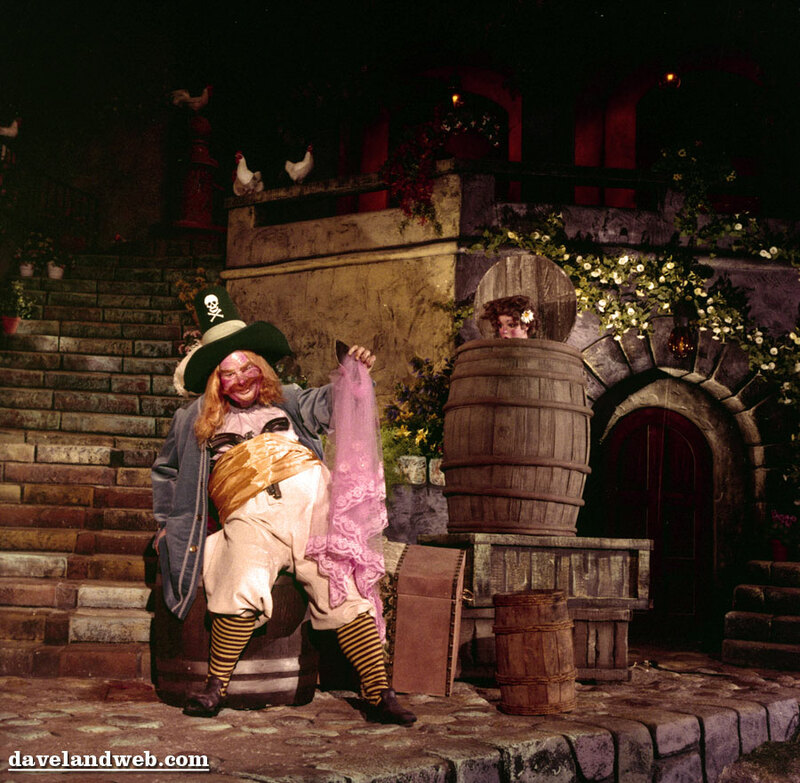 One of them included this scene with the pirate holding a woman’s undergarment as she hid in a barrel, and he mutters, "she was a feisty one, she was.” Whether these changes were made to soften the tone of the ride or to improve the storyline is still debated. But in the end, who cares...it’s still a classic ride. 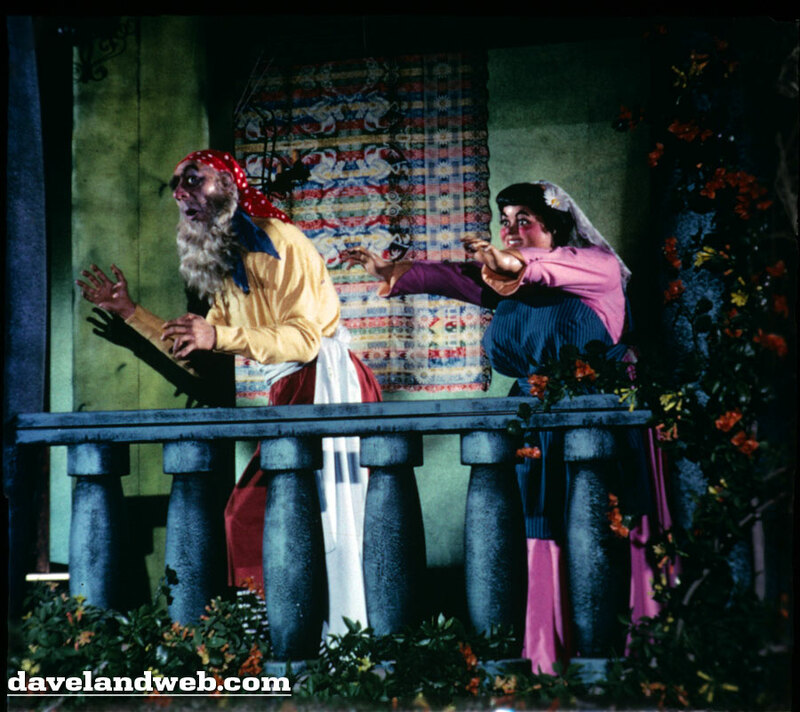 See more current and vintage Pirates photos on my web page. 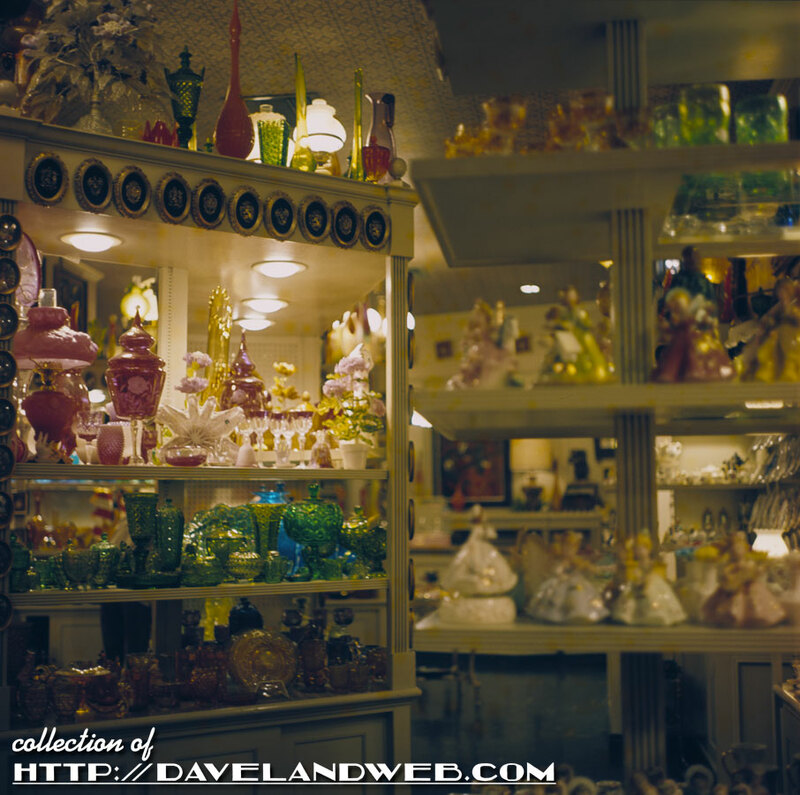 This transparency is from a set of cool 60’s Disneyland views; although I am not positive about whether this is the China & Glass Shop on Main Street, I do know one thing for sure: I wouldn’t buy a single thing from this place! Looks like a bad yard sale. Hey experts—can you identify this place? 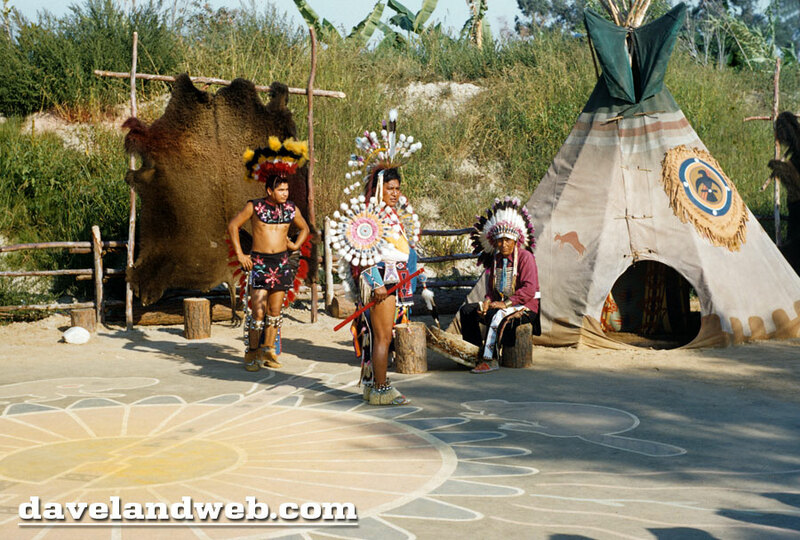 See more current & vintage Disneyland photos at my regular website. This poor feller has a bad case of heartburn; and it’s not from the mozzarella sticks at the Stage Door Cafe, either. The burning cabin and dead settler always took me by surprise as a little kid; just didn’t seem very Disney, but neither did the death of Bambi’s mother. Life is also about dark and creepy things; even Walt understood that. Follow my Daveland updates on Twitter. 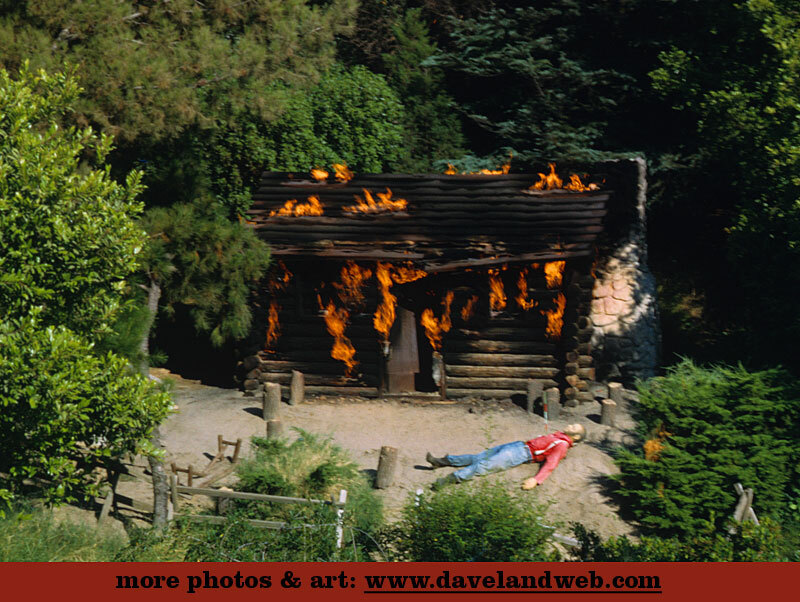 See more vintage Burning Cabin photos at my website. Taking a little break from my signage fetish and moving onto another fave of mine: retro! 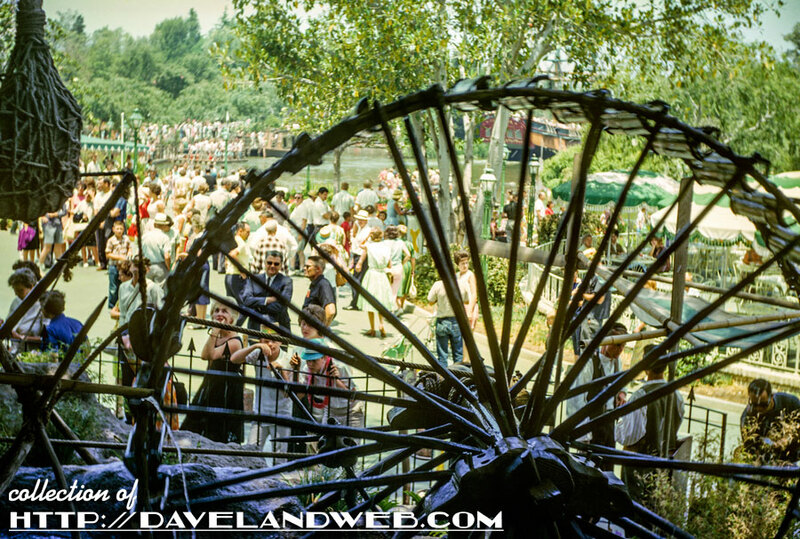 Yes, even Tomorrowland is retro in this slide from July, 1963. The hats, the outfits,...oh yes, and don’t forget America the Beautiful in the Circarama Theatre. I remember how cool it was to stand and watch the movie as the screen surrounded you. Beats the hell out of Star Tours. 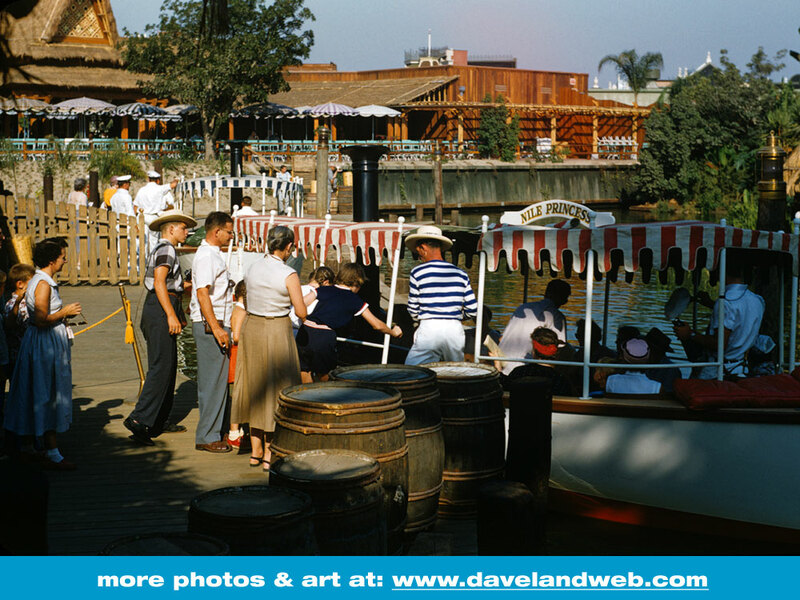 See more vintage Disneyland photos at my website. 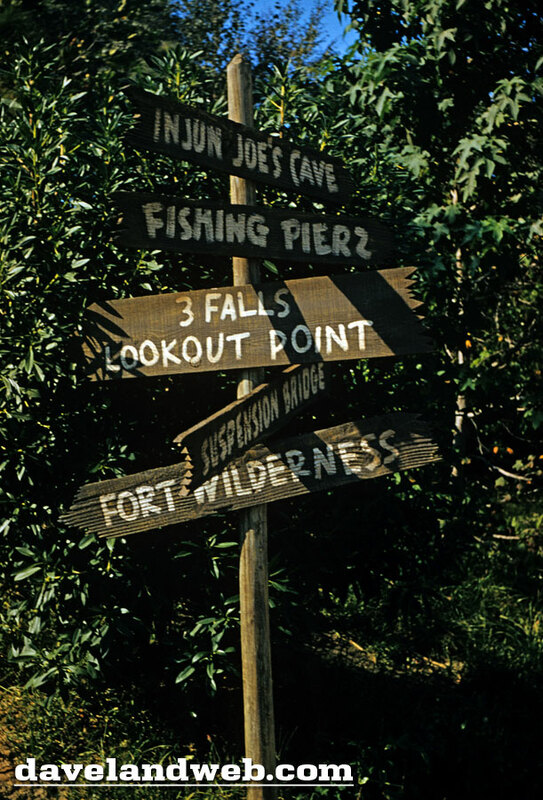 From August 1960 comes this rustic signage on Tom Sawyer Island. I don’t believe these are still there (or maybe they have been updated), as I don’t remember seeing them on my last visit to the island. Their rustic nature really adds to the experience of exploring. Follow my Daveland updates on Twitter. 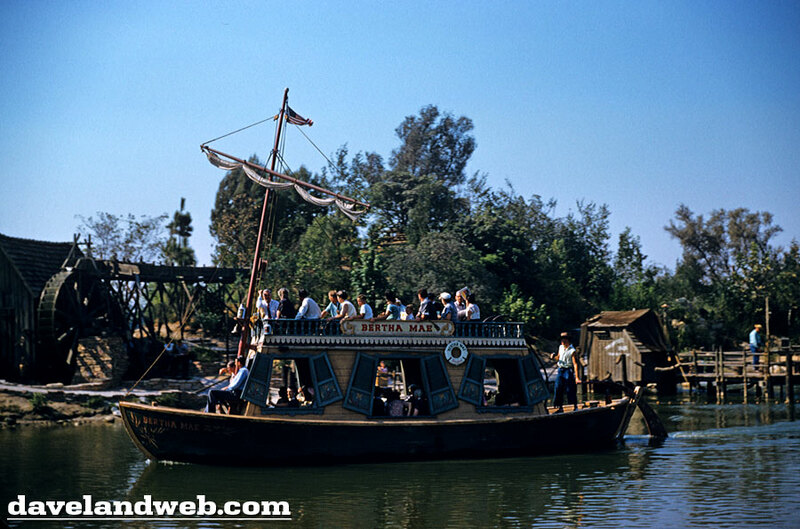 See more vintage & current Tom Sawyer Island photos on my Disneyland TSI web page. 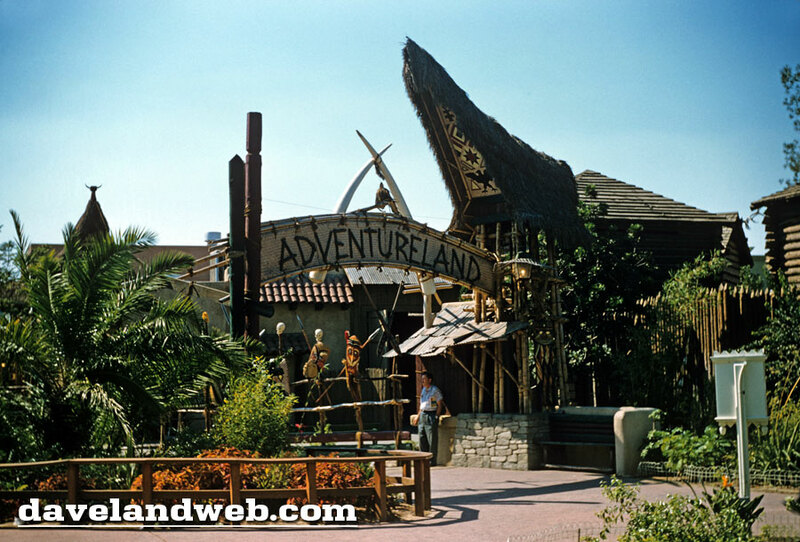 Here’s an early look at the entryway to Adventureland; this one shows the tile roof that is visible in the background of Walt Disney in a previous posting. Follow my updates on Twitter. 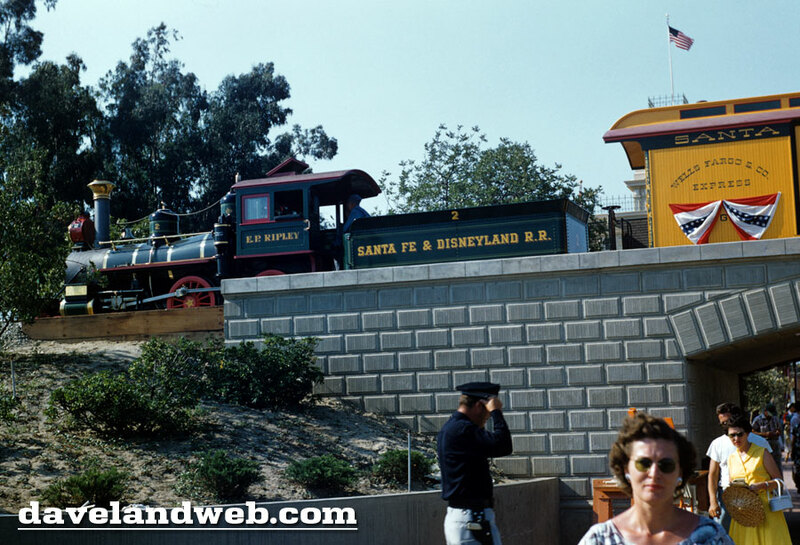 See more vintage Disneyland photos at my website. 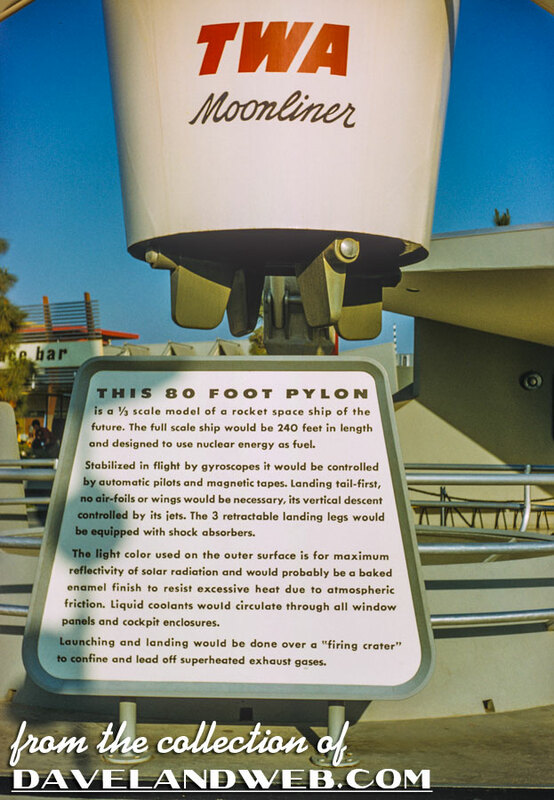 I have no idea who took this photo of the signage for the TWA Moonliner, but this is the type of photo that I would have taken had I been there. I’m a signage freak (it’s part of what I do for a living) and always notice details that most would probably pass over. This one is from August 1956. See more vintage Moonliner photos at my website. 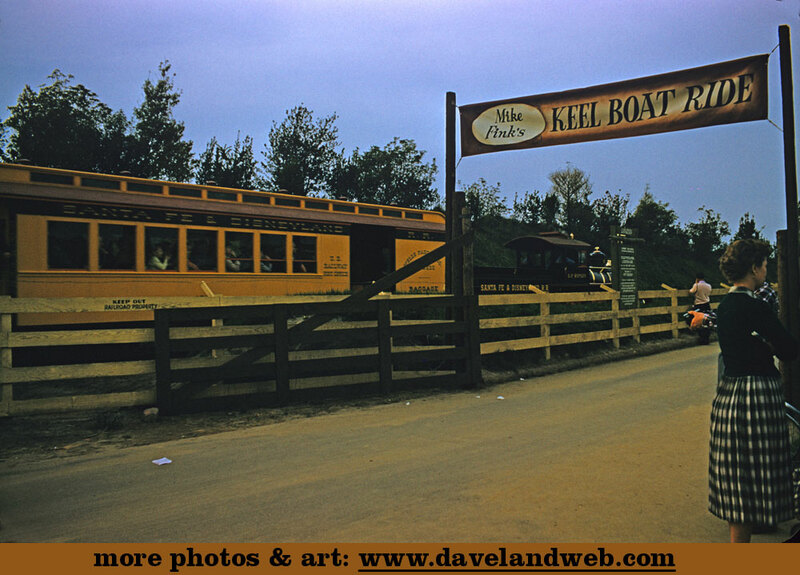 From August, 1956 comes this slide of the Bertha Mae Keel Boat on the Rivers of America. One day, the Keel Boats will hopefully return. The rafts are nice enough, but they just don’t have the same charm. I have also included a slide from December, 1955, with the E.P. Ripley and a banner advertising the Mike Fink Keel Boats. 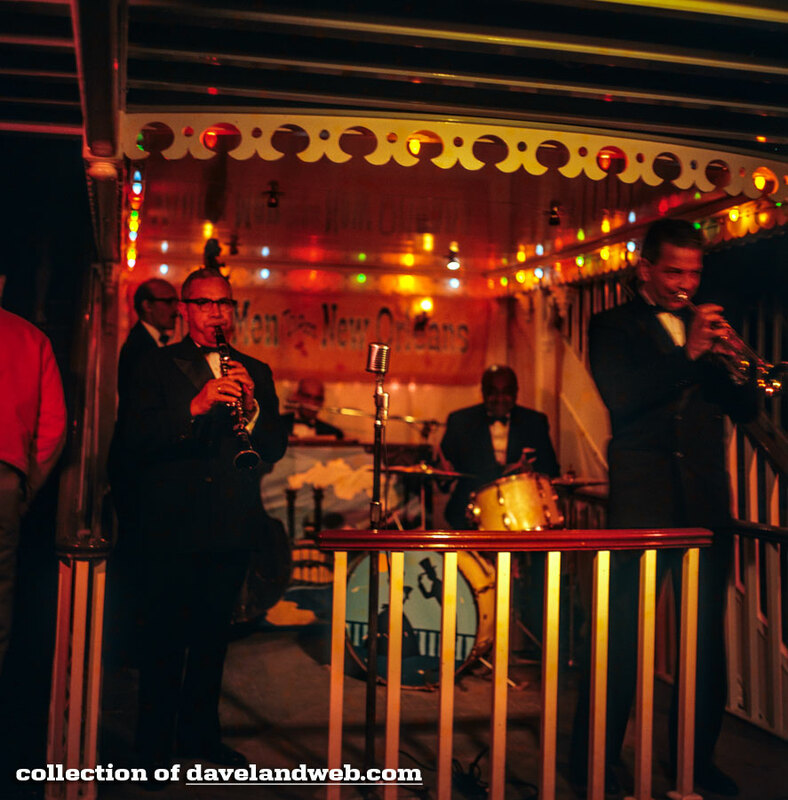 This Jazz Combo aboard the Mark Twain is “The Young Men from New Orleans.” Having live music aboard the Riverboat is a nice touch, and sure would add a lot to the park experience today. The vintage of this transparency is probably the late 60’s or early 70’s. See more Mark Twain photos at my website. 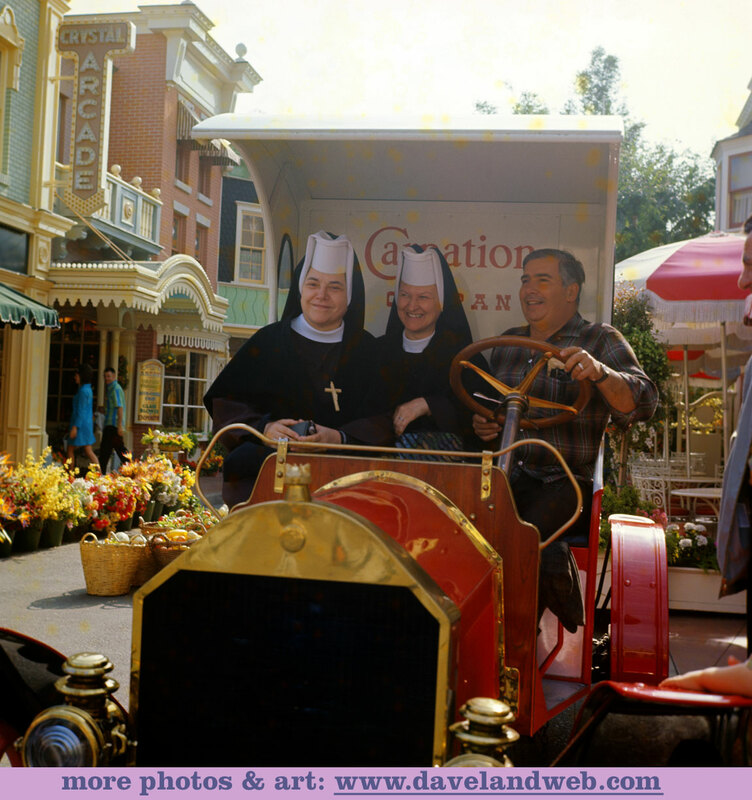 I am sure someone much wittier than I could come up with a funnier caption; either way, I really love this slide of the nuns in the Carnation vehicle near the Crystal Arcade. The vintage of the transparency is probably the late 60’s or early 70’s. What a beautiful shot from 1955 of the Nile Princess. This could also be subtitled "Jungle Cruise without the Jungle." Fifty years of landscaping maturing certainly adds to the park and makes it seem bigger. 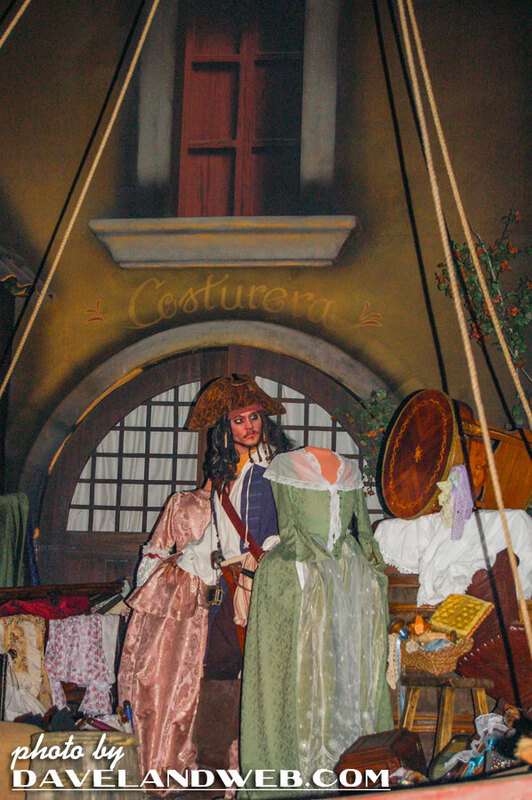 Be sure to notice the vintage outfits, hats, and uniforms of the cast members. Today I am straying from the vintage format to show a few shots I took of the newly revamped Pirates attraction at Disneyland. 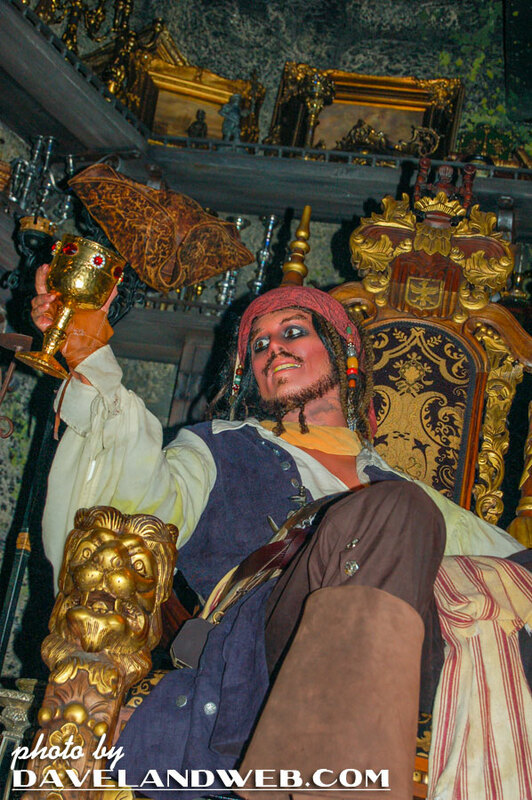 Although I miss a few of the old familiar sights (Blackbeard on the ship and especially the struggling looters at the end of the ride), I have to say that overall they did an awesome job. Follow my Daveland updates on Twitter. 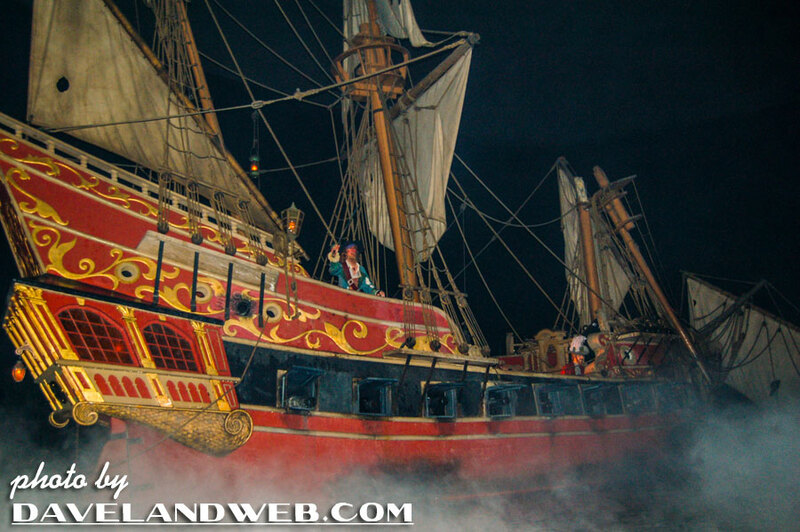 See more POTC photos at my Pirates of the Caribbean web page. And they do not look happy. You can tell by the shadows on the left that there’s a crowd waiting to see a show, but for some reason (the heat maybe?) these Indians don’t look like they want to perform. More from this same batch at my website. Here’s the E.P. Ripley, pulling into the Main Street Train Station in 1955. With the bunting on the train, I could only hope that just maybe this slide is also from opening day. The Major spotted the gun in the policeman’s holster. Could that be a REAL one at Disneyland?!? Three more from this same batch have just been added to my website. 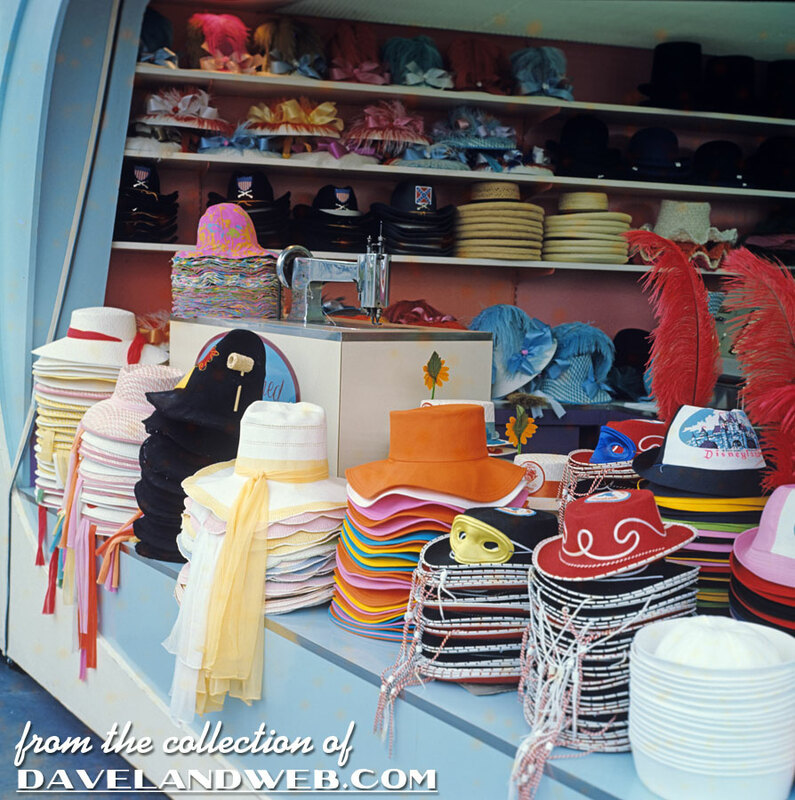 In appreciation for all the great photos that Matterhorn 1959 has shared on his blog, I am presenting this transparency from the 60’s with a whole slew of hats for sale (not to say that he appears to have a hat fetish, but...). Not sure where this cart or shop is located, but I figure somebody will be able to drop a comment or two. 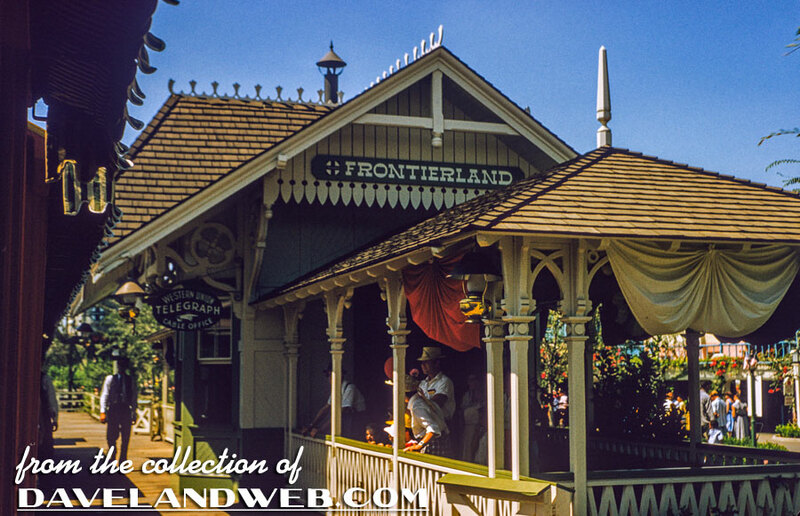 For more vintage Disneyland, check out my regular website where I just added a few new ones today. With the bunting on the now defunct Bandstand, this photo is either from a July 4th celebration or Opening Day in 1955. Either way, it’s a good view of this ornate gazebo where guests could rest their weary bones and here live music. Hope you all have a happy and safe 4th—time for me to get the BBQ going! 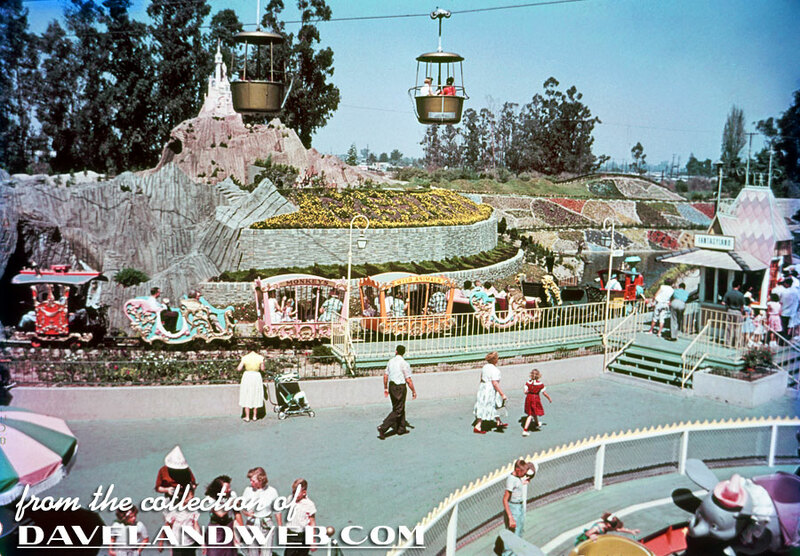 For more vintage Disneyland, check out my regular website. A little bit of everything in this shot: Casey Junior (and Ticket Booth), Cinderella’s Castle in Storybook Land, Dumbo’s Ride, and The Skyway. Throw in a few vintage tourists for good measure (love the girl in the middle with the red dress and matching socks!). Hey experts - any idea as to the date of this one? 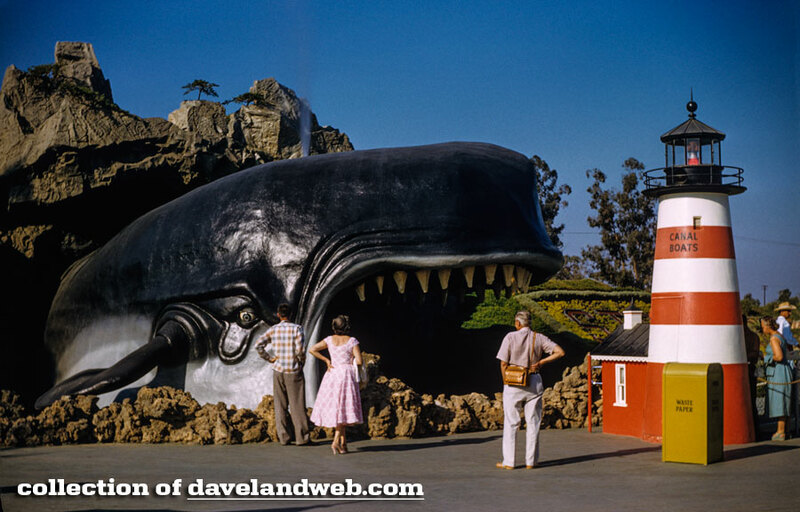 For more vintage Storybook Land photos, check out my regular website. 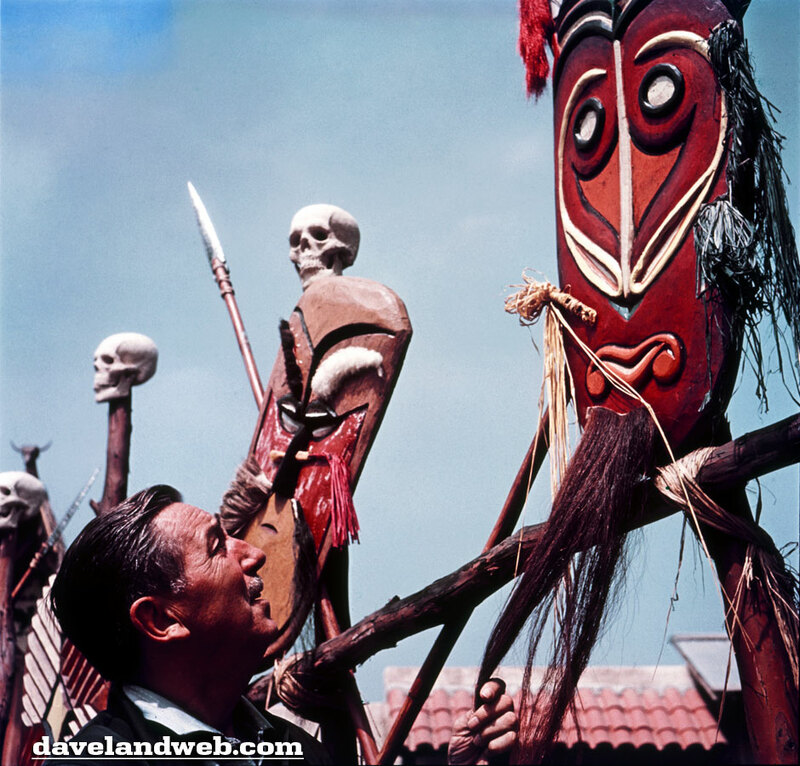 Here’s a great photo of Walt in what appears to be Adventureland, surveying the skulls and other decor located near the Adventureland gate. It may seem a little funky to see skulls at Disneyland, but this is one of my favorite entryways at the Park. Follow my updates on Twitter. 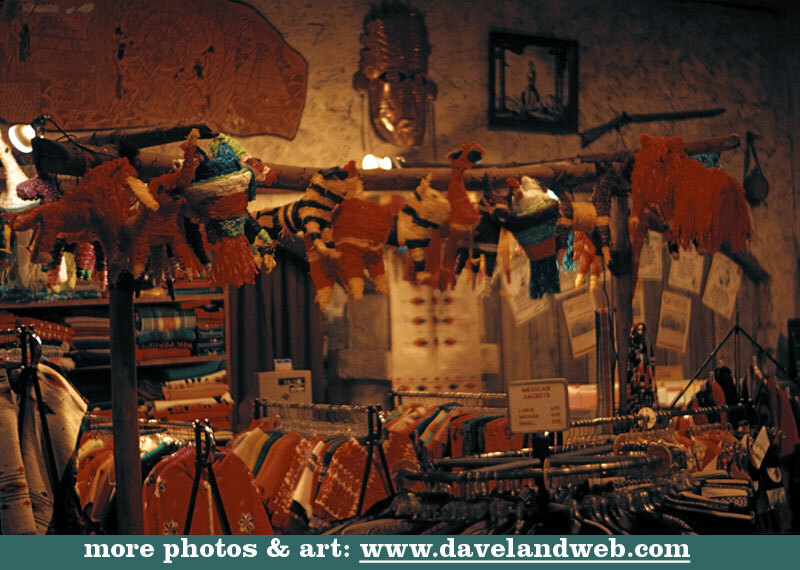 For more Adventureland photos, check out my regular website. 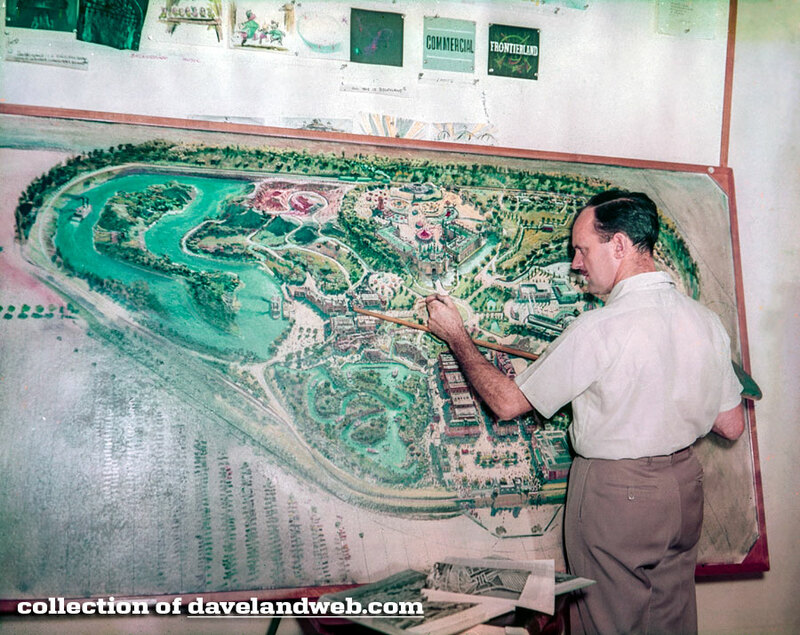 Here’s a way cool shot of Peter Ellenshaw, matte artist supreme, working on the concept painting of Disneyland that was introduced by Walt on the “Disneyland” TV Show (which helped pay for the park). Although there were a number of changes (such as the huge fortress wall around the castle and Fantasyland area), it is just as interesting to notice how much actually stayed the same. Thanks again to Matterhorn for identifying Ellenshaw for me.